Take maida, salt and oil in a bowl and mix it. Add water in parts and knead to firm dough. Cover dough and keep aside for 30 minutes. Heat oil. Add lehsun. Sauté for 10 seconds. Add onions and sauté for 20 seconds. Add all the finely chopped vegetables. Increase the flame and stir fry the vegetables on high heat. When the edges starts getting golden, add soy sauce, salt and pepper. Continue to stir fry on high heat till the vegetables are cooked. Takes about 8 to 9 mins on a high flame. Later add 1 to 2 tbsp of the spring onions greens and stir fry for a minute. Check the taste and add more salt, pepper or soy sauce, if required. Divide the dough in two parts. Make a 6-7 inch log from each part. Cut the log into equal slices. Make ball of each slice and keep them covered with a moist napkin. Take each dough ball and on a lightly dusted board, roll each dough ball into a thin circle of about 2-3 inch diameter. Try to get the edges to be thin and the center to be thick. Place 1 or 2 tsp of vegetable stuffing in the center. Lift one side of the edge and start pleating. Start folding and forming the pleats one by one. Towards the end, join the pleats in the center. Prepare all momos this way and keep them covered under a moist napkin. Till you are ready to steam them. Heat water in a steamer or in a pressure cooker. Let the water boil. In a greased steamer pan or in idli moulds, place the momos keeping space between them so that they don’t touch each other. Steammomos for 5-6 minutes. Don’t overdo the steaming, as the dough becomes dense and dry. The steaming time may vary upon the thickness of momos’ cover. When you touch the momo, then dough should be sticky to touch. This means they are done and the momos will have a transparent look. Time of cooking momos varies from intensity of the flame and kind of pan and the steamer you are using. Once done, garnish veg momos with spring onion greens. 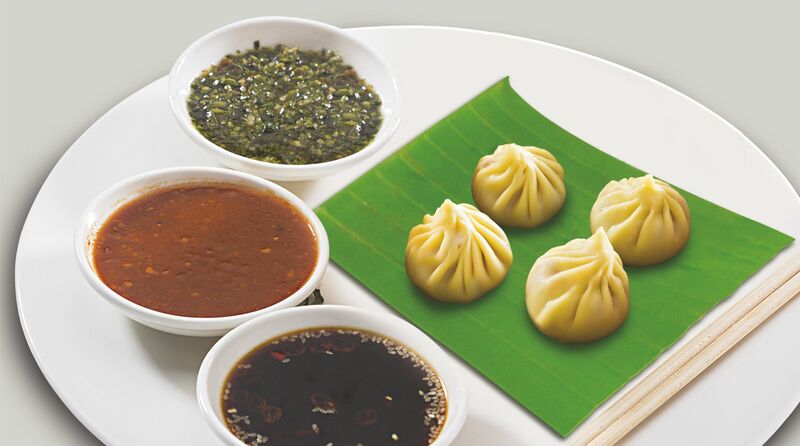 Serve vegetable momos with a spicy sauce like schezwan sauce or tomato-chilli sauce or chilli sauce. You can also serve it with red chilli lehsun chutney. Momos go very well with a spicy sauce. To steam the momos in a pressure cooker – heat about 2 cups water in the pressure cooker. Place the momos in a pan inside the cooker. Remove the vent weight/whistle and steam the momos for 5 to 6 mins. If not done, then steam for a few more minutes. The water should not come in contact with the momos. To steam in an idli pan – proceed same way you make the idlis. Heat water in the pan. Grease the idli mould with oil. Place the momos on the idli moulds. Place the moulds in the pan and steam the momos.